Lee Angol of Posh consoled by West Brom midfielder Craig Gardner after seeing the final penalty in the shoot-out saved. Photo: Joe Dent/theposh.com. Peterborough United manager Graham Westley felt West Brom’s greater experience helped them win the penalty shoot-out at the end of an absorbing FA Cup tie at the ABAX Stadium tonight (February 10). Martin Samuelsen and Lee Angol saw their spot-kicks saved by West Brom ‘keeper Ben Foster, while Darren Fletcher missed the target for the Baggies. Lee Angol's penalty is saved by West Brom 'keeper Ben Foster. Photo: David Lowndes. 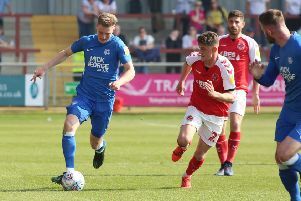 It was a surprise that Posh midfielder Erhun Oztumer didn’t take a penalty, but this wasn’t a night for recriminations or an inquest as the generous applause that rang around the ABAX at the end of the shoot-out suggested. Martin Samuelsen's penalty is saved by West Brom 'keeper Ben Foster. Photo: David Lowndes. Posh players stand together as their exit from the FA Cup is confirmed. Photo: Joe Dent/theposh.com. Posh: It’s all over Posh as Lee Angol approached his penalty with a very nervous, tired-looking, shuffling run-up and it’s no surprise that he sends it too close to Foster who makes a comfortable save. FINAL SCORE: West Brom 4, Posh 3.